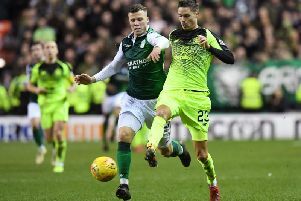 Hibs are waiting to learn if their move to bring back Scottish Cup final hero Liam Henderson has been successful. The Easter Road club have contacted Celtic about the possibility of signing the 20-year-old midfielder, initially on loan with a view to a permanent transfer. Henderson enjoyed a fruitful year at Hibs last term where he started 40 matches and scored six goals under Alan Stubbs. The West Lothian-born youngster, who was already highly regarded among the Easter Road faithful, went on to earn hero status when he came off the bench in the Scottish Cup final against Rangers in May and delivered two brilliant corner kicks which allowed Anthony Stokes and David Gray to turn a 2-1 deficit into a historic 3-2 victory. Henderson returned to his parent club – whom he is contracted to until 2018 – for pre-season but, despite featuring in friendlies, the Scotland Under-21 internationalist has been unable to force his way into new manager Brendan Rodgers’ plans for the season ahead. He was not part of the Celtic squad that travelled to Kazakhstan for the Champions League qualifier with Astana. Hibs have been monitoring his situation and, after making their move, they are hopeful of finding out in the coming days if they have got their man.